Love is an uncanny emotion as it is ever evolving. But this story is not only about love. It is an amalgamation of appropriate amounts of drama, anxiety, love, romance and regret. The story revolves around Raehan and Amolika, two young souls who are subtly struck by cupid during their college days. The commendable character sketch of these ‘round’ characters is worth praising. With an objective atmosphere, the story describes the plethora of pathos in their life. Simple and predictable, the story progresses through a lot of ups and downs that drive the two protagonists apart and then destiny whirls its charmed wand and tries to bring them closer again. What I liked about this book is the analogy drawn between happy days and the spring season. In that sense, the title makes absolute sense and is apt. 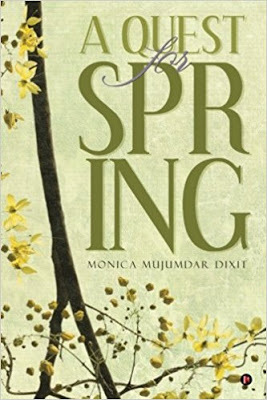 However, the cover fails to appeal owing to the way in which ‘SPRING’ has been printed. ‘A Quest for Spring’ is a simple read. The plot of the story is predictable and is not new to the readers. The narration is lucid and easy to comprehend. The dialogue delivery is fine. But the major problem lies in awful editing that might surely irk the readers. Another problem is the meek character sketch of the side characters; they act like mere caricatures. A little more about them would have balanced the story. Overall, a good yet simple plot that is comprehensible but clichéd.